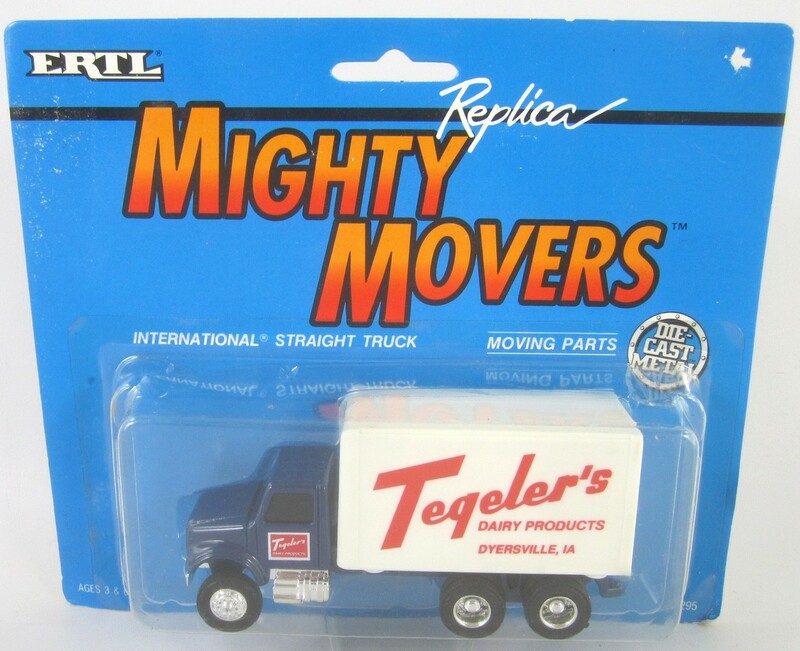 This Page will include Semi truck models of Peterbilt, Freightliner, Ford, White GMC and more. 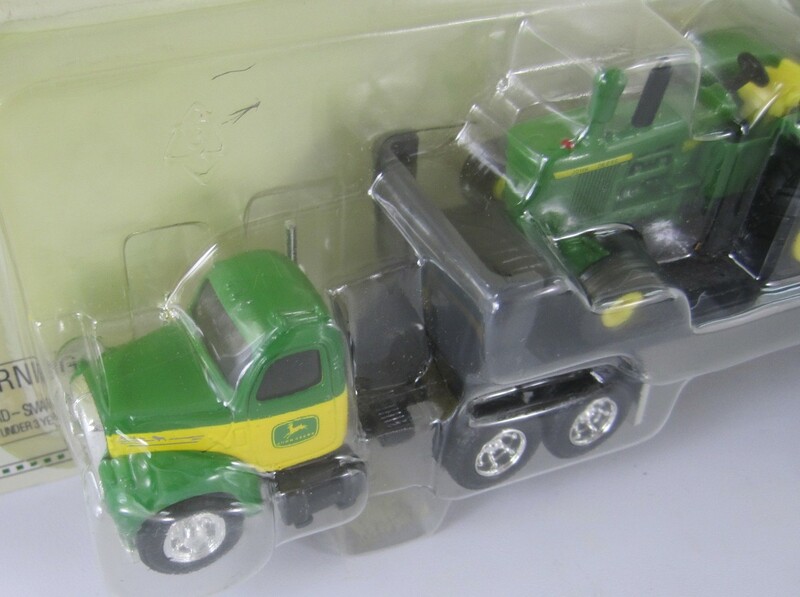 They will include tractors and implements made by Ertl, DCP, Diecast Promotions, Hartoy, PEM, Winross and Spec Cast. All are 1/16 scale and New in Box unless noted. 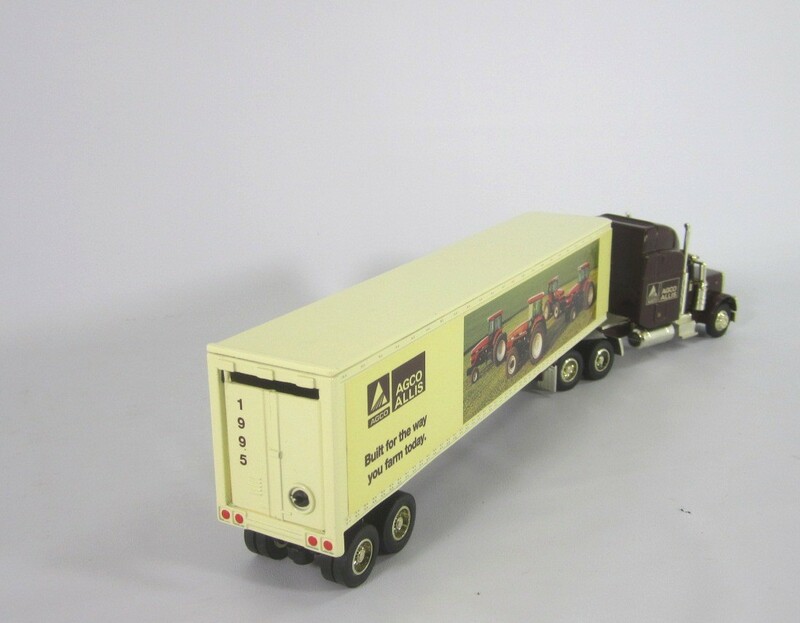 SpecCast Liberty Classics Stk# 32538 Agco Allis Semi Van Tractor Trailer. Diecast Metal 1/64 scale (11 in long). 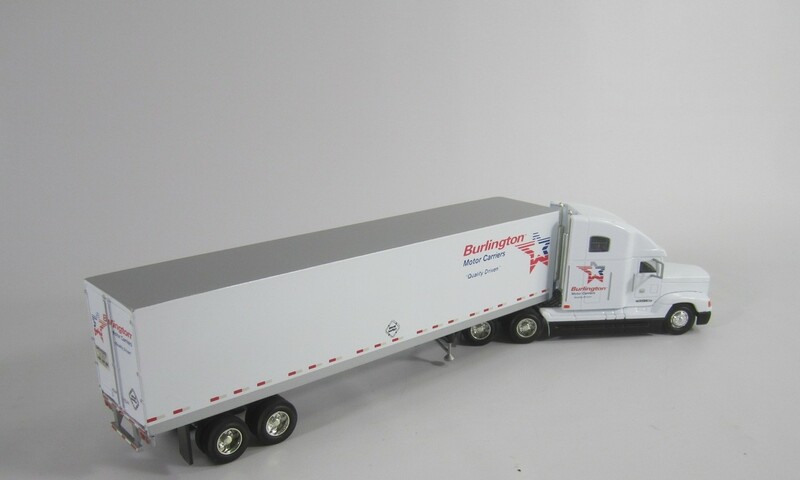 Diecast Peterbilt 379 Cab and Diecast Trailer with opening rear door. 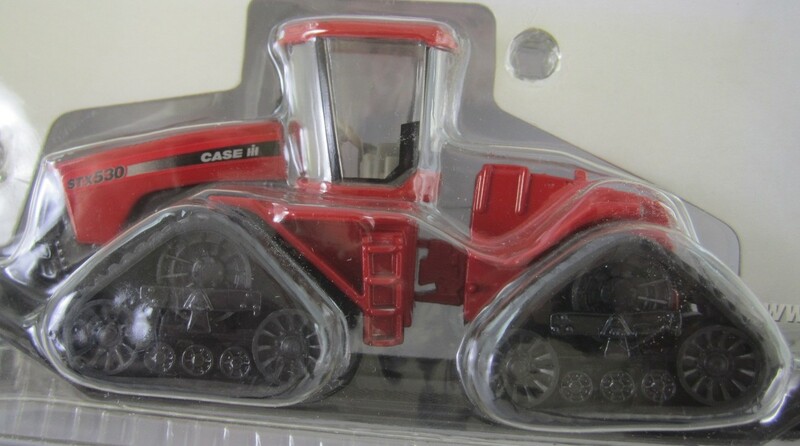 "Built the Way you farm today"
New with Package, Has been displayed in a case. There is a scuff type scratch on the hood as shown in the hood photo. 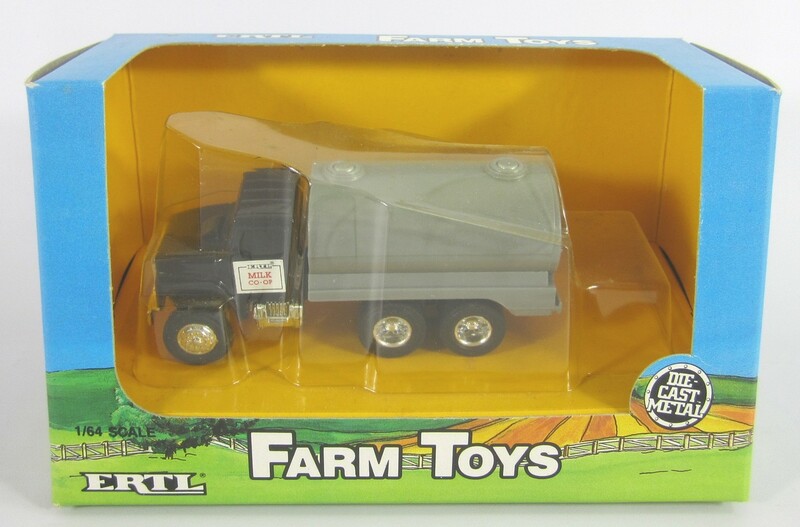 Ertl Stk# 2292 Agco Farm Tractors and Implements Semi Van Tractor Trailer. Diecast Metal 1/64 scale (11 in long). 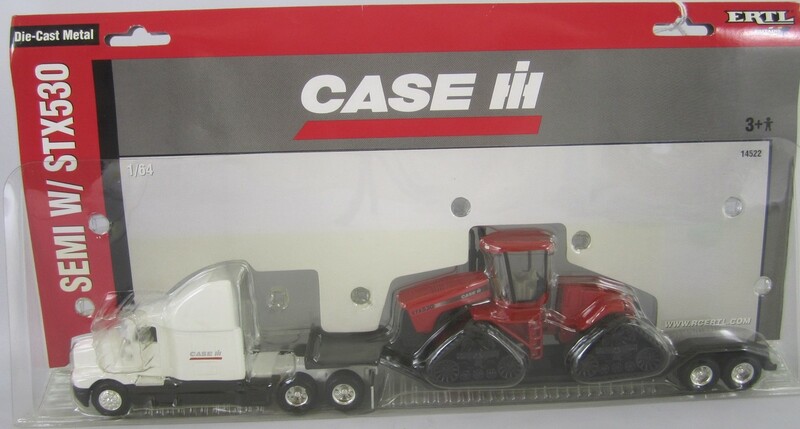 Diecast IH Cab and Die-cast Trailer with opening rear door. Made in USA Dated 1992. New in Package, Opened Only for Photo. 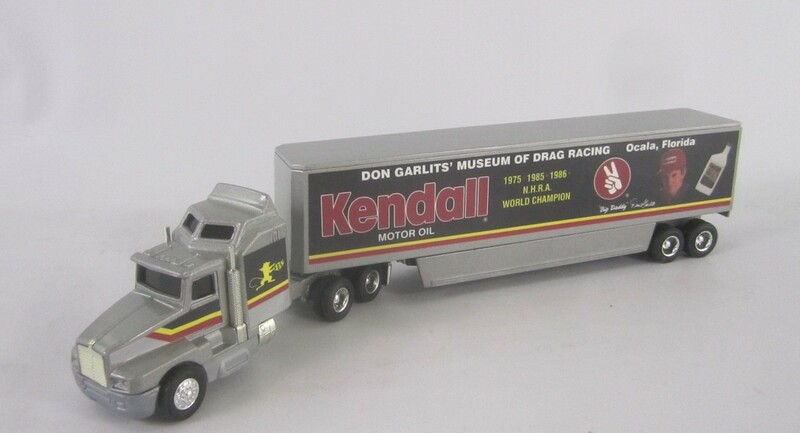 Ertl Stk# 9301 Big Daddy Don Garlits Transporter T/T. 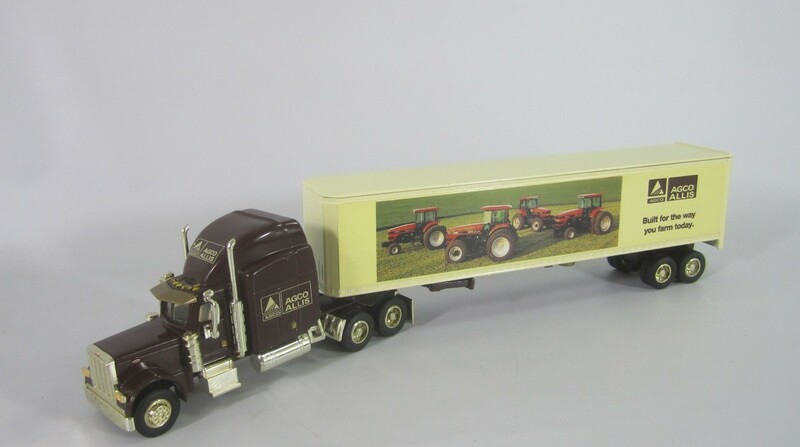 Diecast Semi Cab and diecast Trailer with opening read door. Museum of Drag Racing, Ocala Florida. No. 1 in the Super Hauler Series. 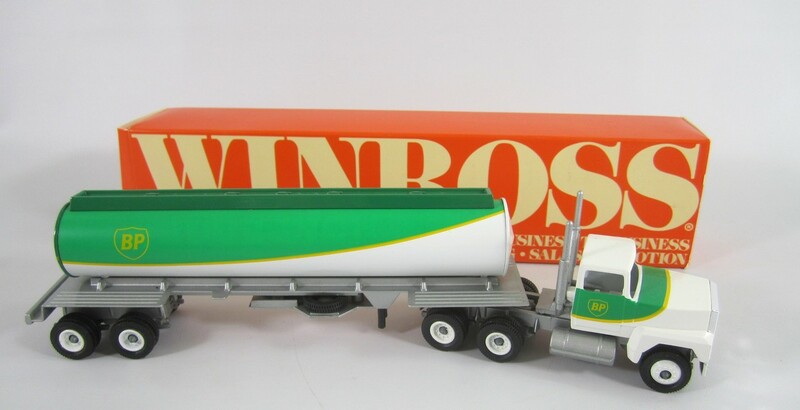 Winross British Petroleum Tanker Tractor Trailer. Diecast Metal 1/64 scale (10 in long). Die-cast Ford cab and die-cast trailer. Real rubber tires. 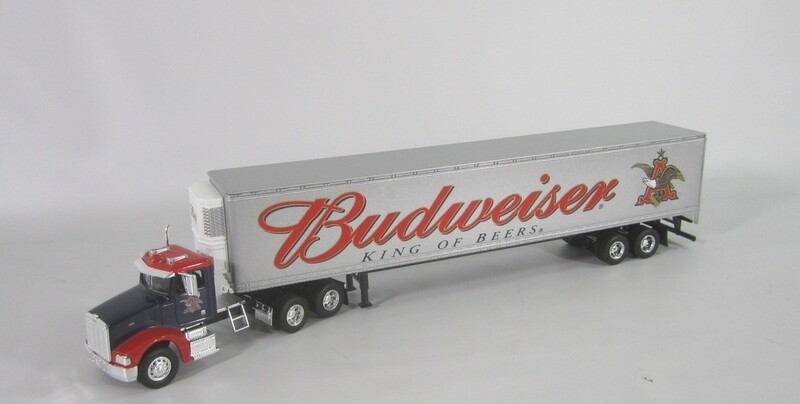 SpecCast Liberty Classics Stk# 33009 Budweiser King of Beers Semi Van Tractor Trailer. Die-cast Metal 1/64 scale (11 in long). 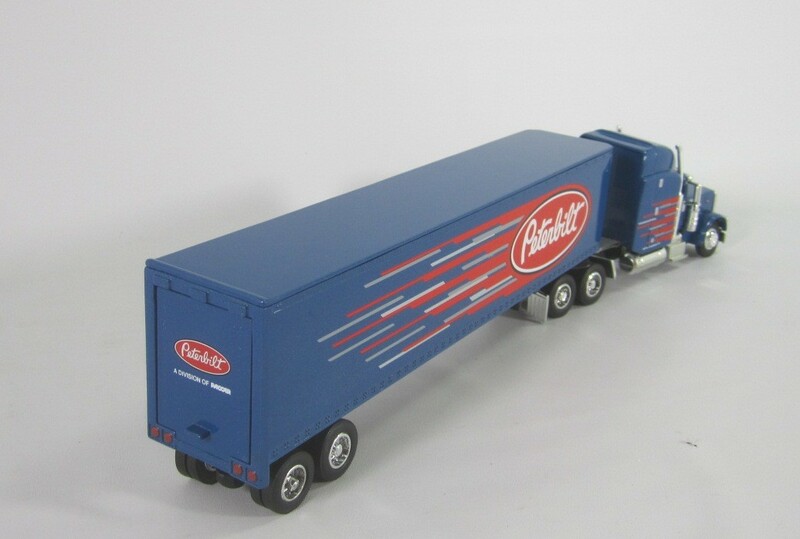 Diecast Peterbilt 385 Day Cab and Die-cast Refrigeration Trailer with opening rear doors. PEM Stk# 73524 Burlington Motor Carrier Semi. 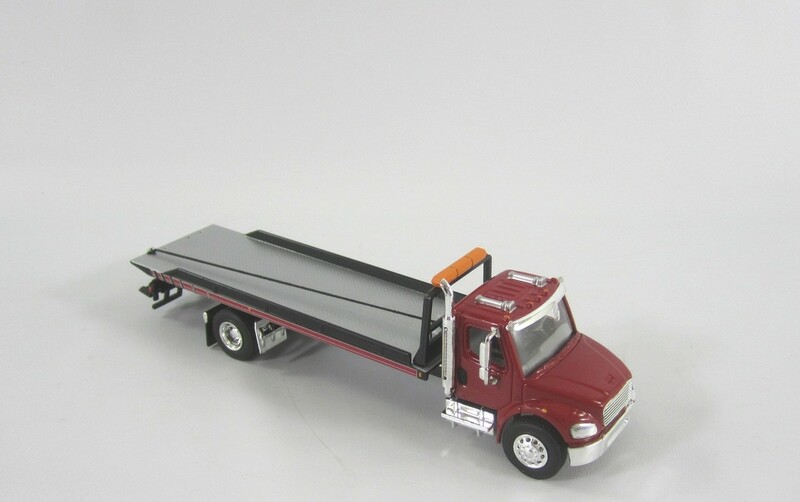 Diecast metal Freightliner and diecast trailer. Very nice Detailed model. 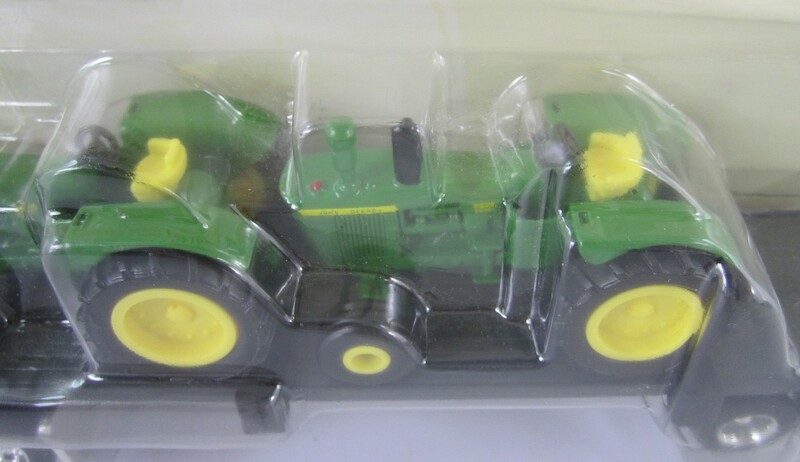 Ertl Stk# 14522 Semi with Case International STX 530 4 wheel Drive Tractor on Tracks in 1/64 scale ( 12-1/2 in long ) die-cast. 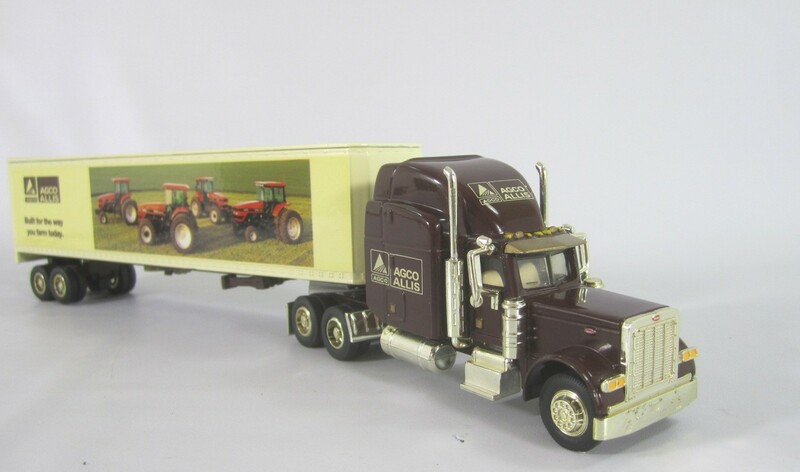 Truck cab is a Kenworth T600B with diecast lowboy trailer. 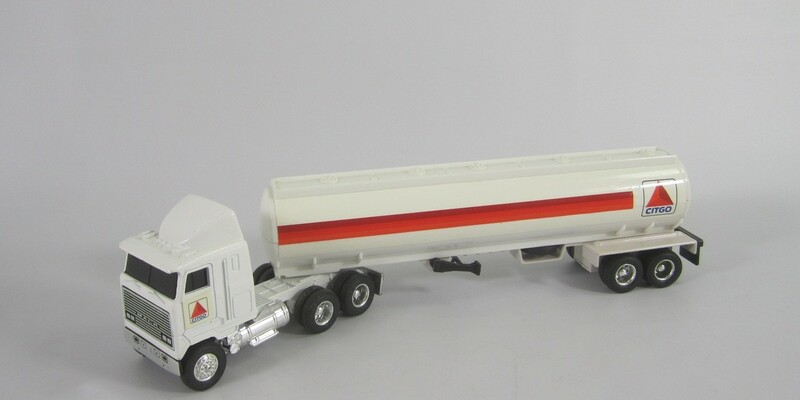 Ertl Stk# 9262 Citgo Gas Tanker Tractor Trailer Semi. 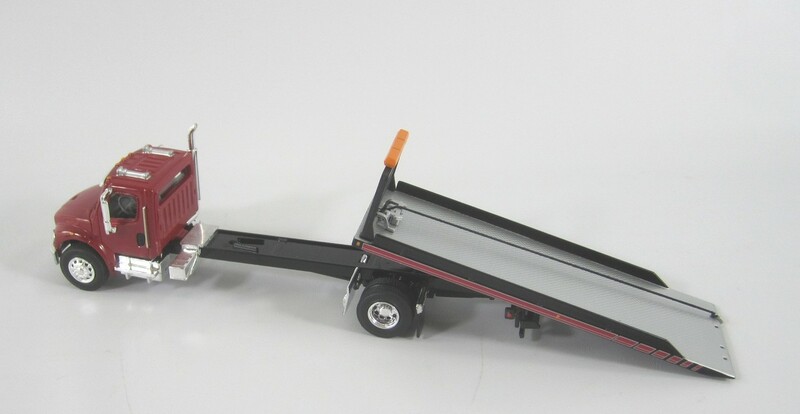 Diecast metal 1/64 scale (11 in long) Mack cab over and plastic trailer. Ertl Stk# 20250 Coca Cola Bear on Skis Semi Van Tractor Trailer. Diecast Metal 1/64 scale (11 in long). 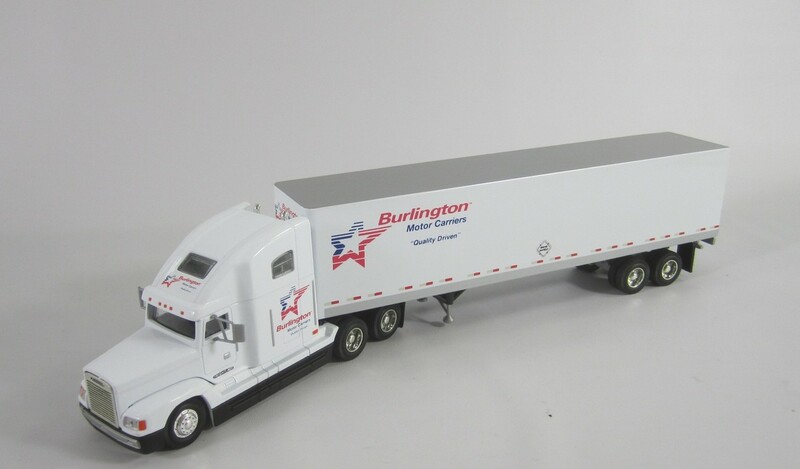 Die-cast Freightliner Cab and Diecast Trailer with opening rear door. 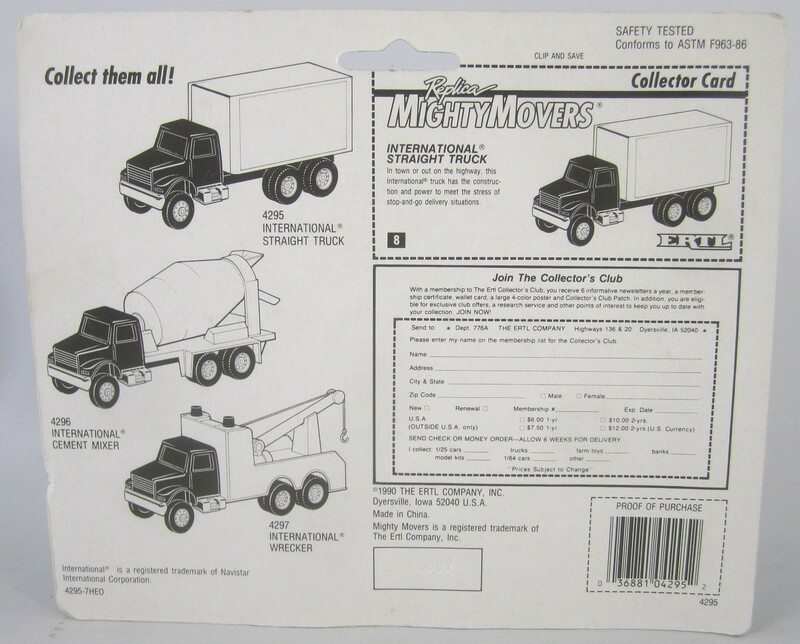 Die-Cast Promotions Stk# 30214 Farley's & Sathers Candy Co. Freightliner Columbia Semi Tractor Trailer. 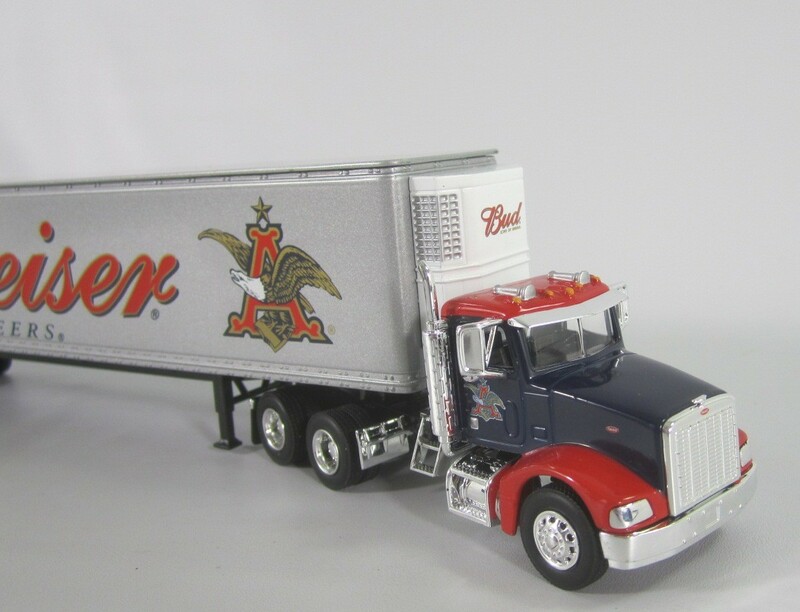 Die-cast 1/64 scale (13-1/2 in long) High detailed cab, Trailer interior, Opening trailer doors and Working suspension. 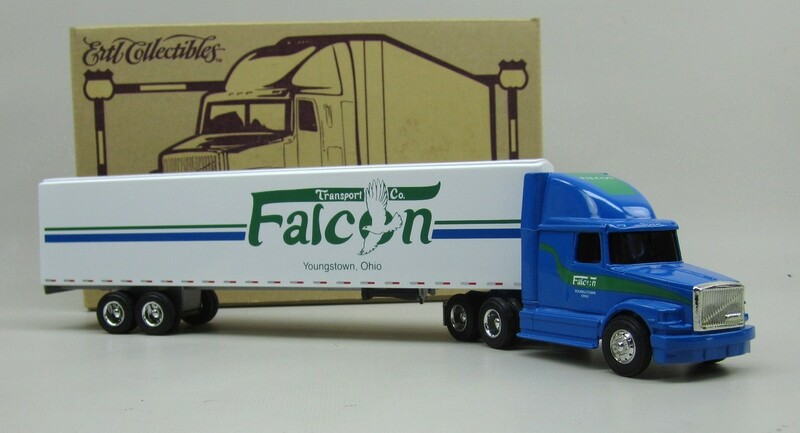 Ertl Stk# 25029 Falcon Transport Co., Youngstown Oh. White GMC Semi Van Tractor Trailer. Die-cast Metal 1/64 scale (12 in long). Die-cast Trailer has opening rear door. 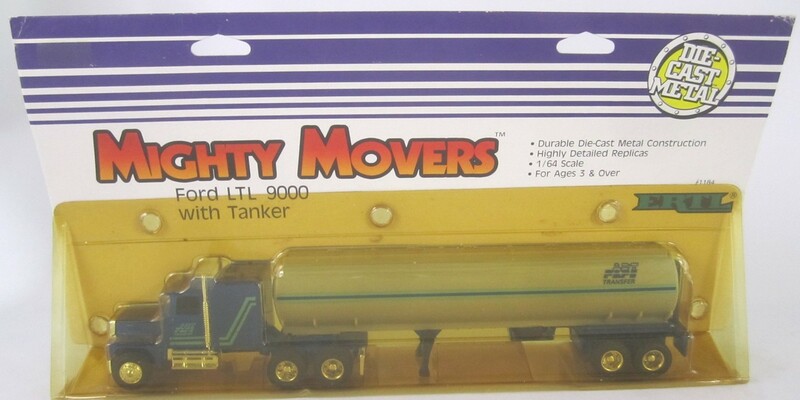 Ertl Stk# 1184 Ford LTL 9000 Tanker Tractor Trailer Semi. Diecast metal 1/64 scale (10-1/2 in long) Ford cab and plastic trailer. 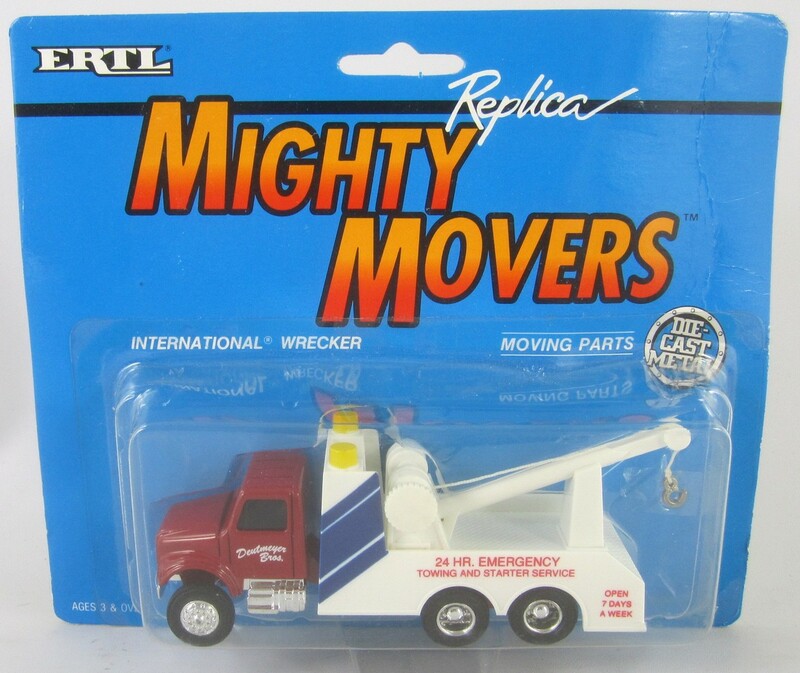 Mighty Movers. Company logo looks like "ART PAPI Transfer"
SpecCast Stk# 35502 Freightliner M2 Rollback Car Carrier. Diecast Metal 1/64 scale (6-1/2 in long). 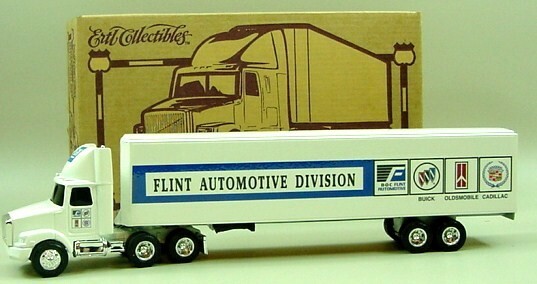 Ertl Stk# T481 Flint Auto Div: Buick, Oldsmobile, Cadillac, B-O-C Flint Automotive. White GMC Semi Van Tractor Trailer. Diecast Metal 1/64 scale (12 in long). 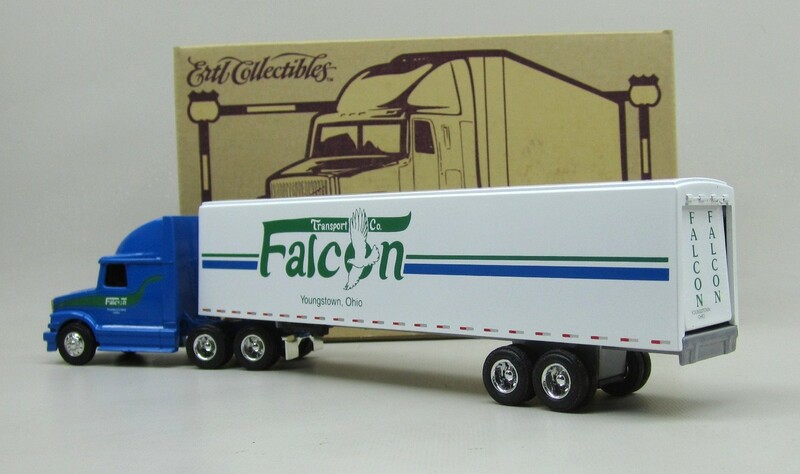 Diecast Trailer has opening rear door. Pad Printed not paper decals. 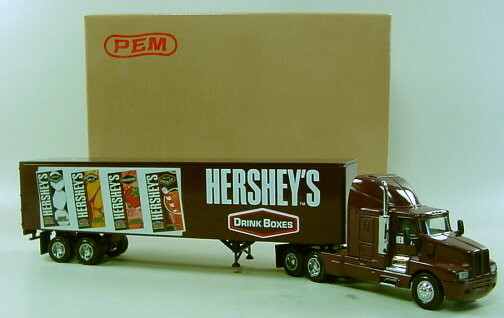 PEM Stk# 70500 Hershey's Drink Boxes. 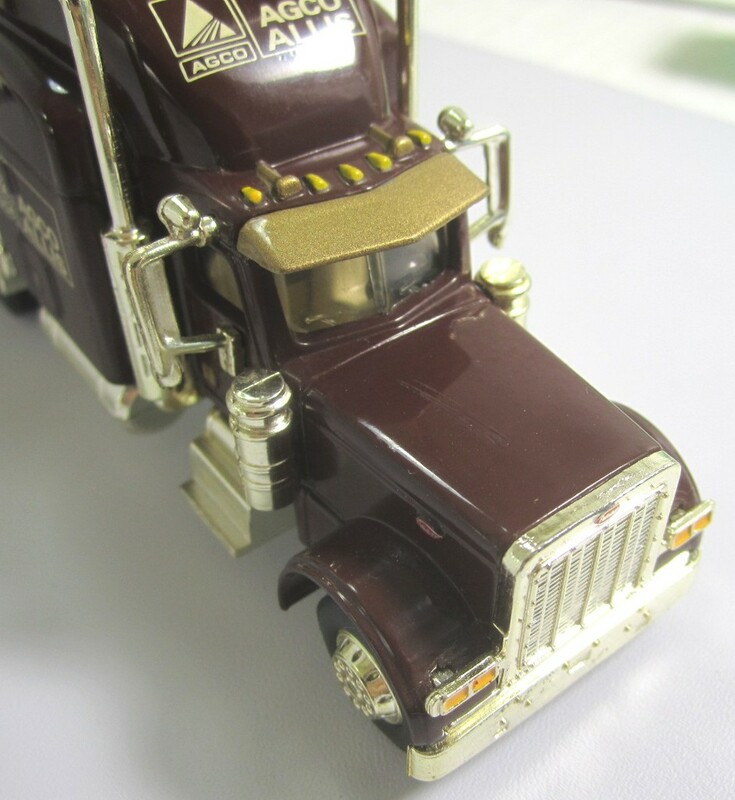 Diecast metal Kenworth T600A. Detailed model. New in Box, Opened Only for Photo. 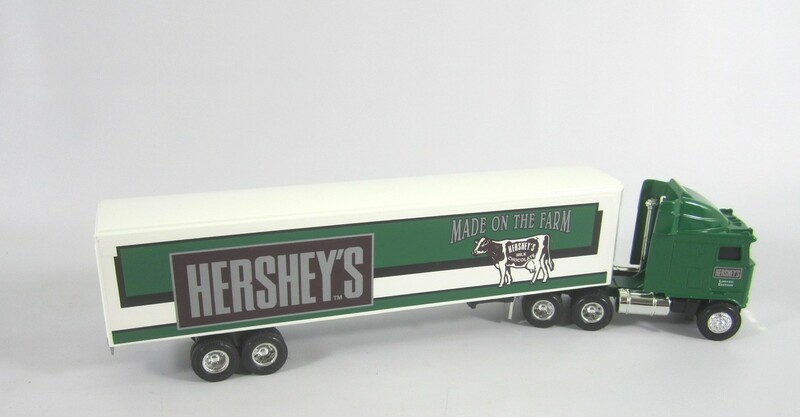 Ertl Stk# T261 Hershey's Made on the Farm Semi Van Tractor Trailer. Diecast Metal 1/64 scale (11 in long). 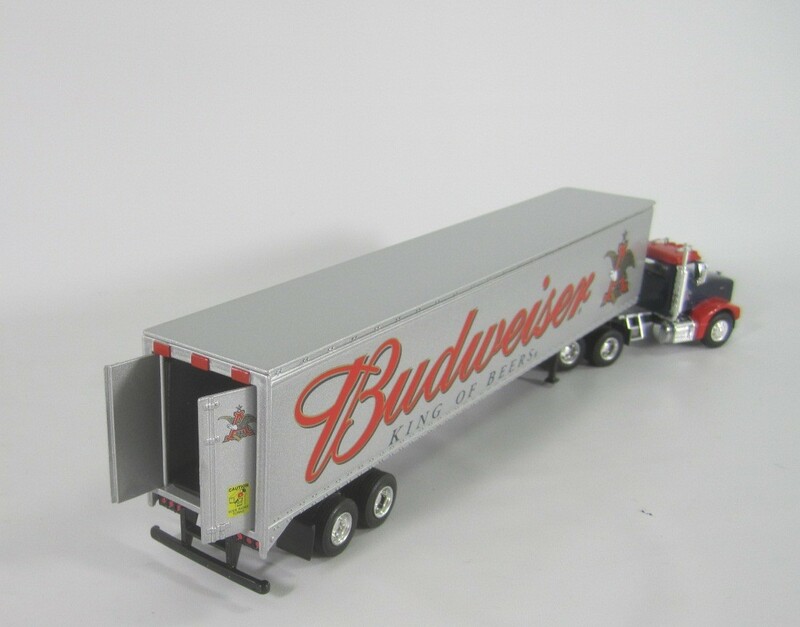 Diecast KW Cab Over and Die-cast Trailer with opening rear door. Real rubber tires. 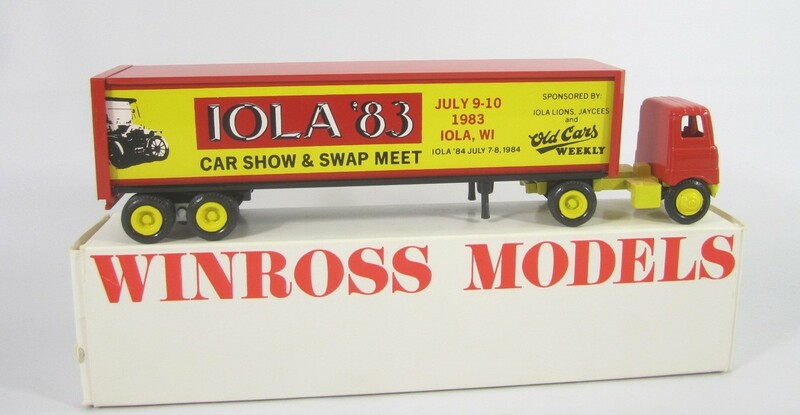 Winross, Iola '83 Car Show and Swap Meet Tractor Trailer. Diecast Metal 1/64 scale (10 in long). 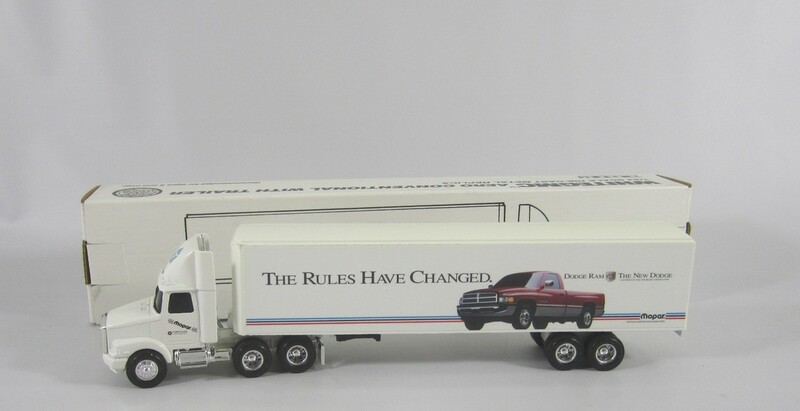 Diecast White 5000 Cabover truck and die-cast trailer. Real rubber tires and diecast rims. 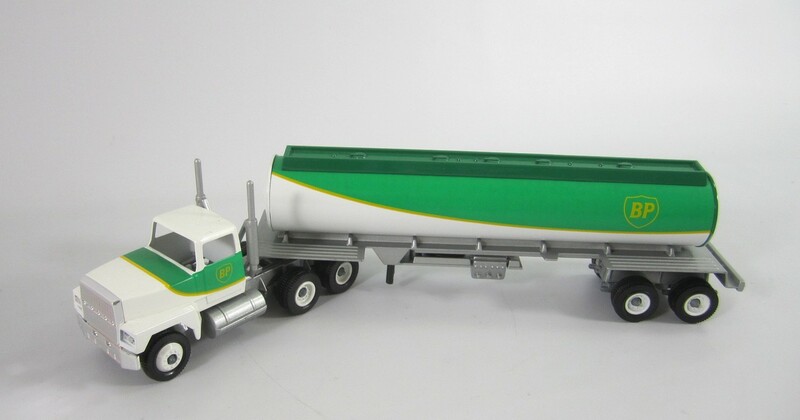 Ertl Stk# 2207 International S Series Milk Tanker Truck Die-cast Metal 1/64 scale (4-1/4 in long). Has rubber tires and a rear hitch. 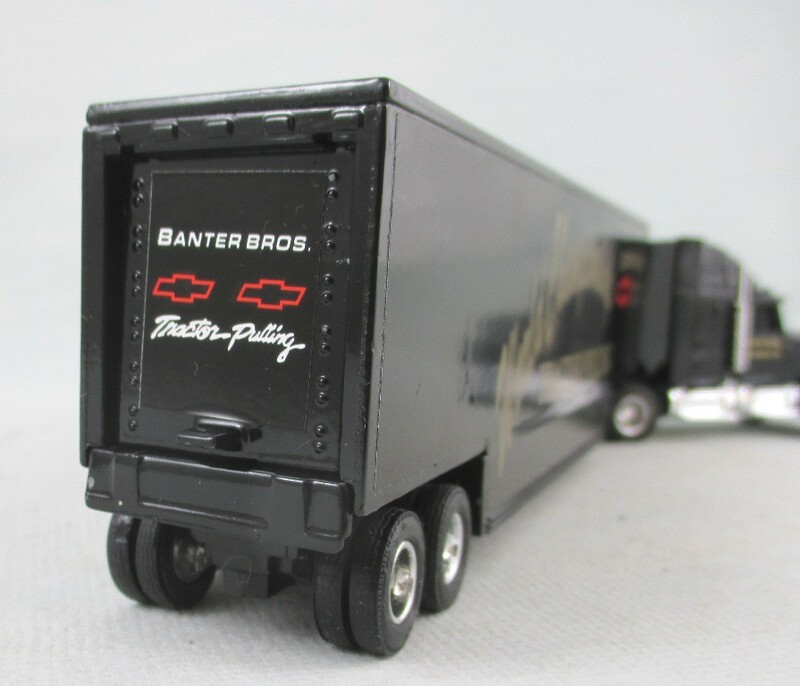 Ertl Stk# 4295 International Delivery Van Truck Die-cast Metal 1/64 scale (4-3/4 in long). Has rubber tires and tow hitch. New in Package, Never Opened. Package may show some wear. 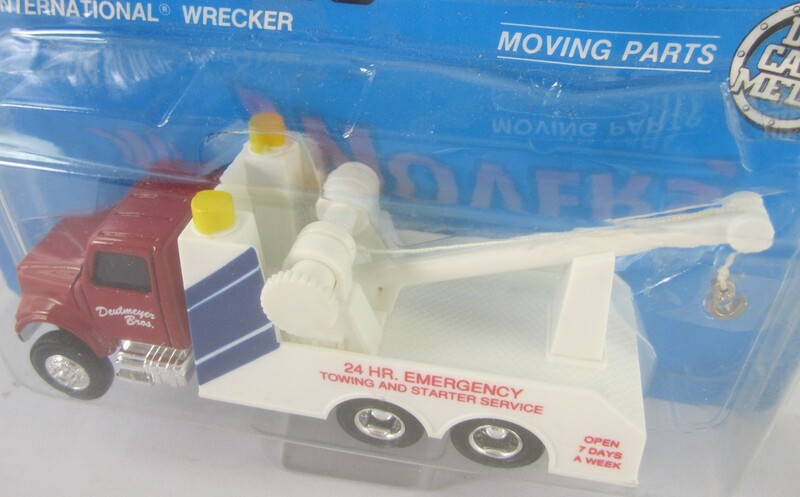 Ertl Stk# 4297 International Wrecker Truck Die-cast Metal 1/64 scale (5-1/4 in long). Has rubber tires and working winch. 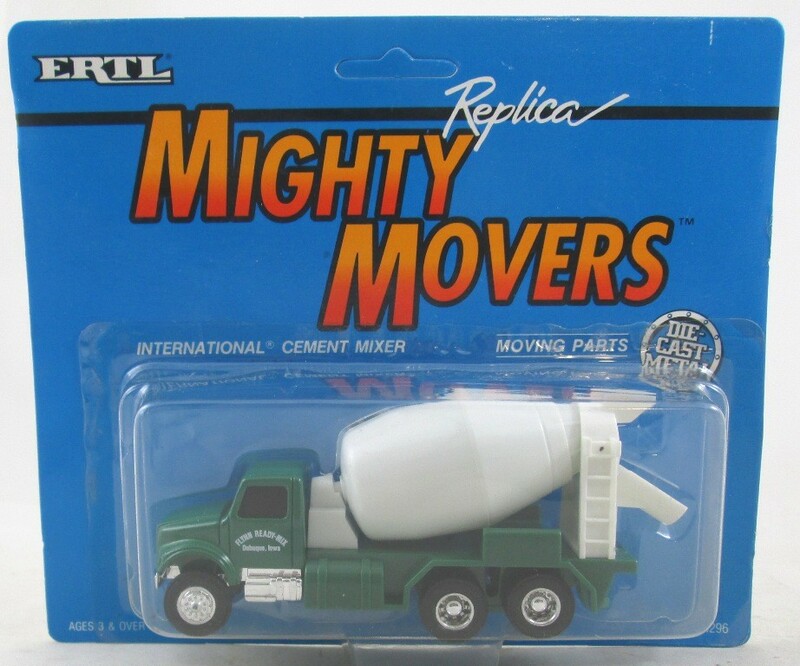 Ertl Stk# 4296 International Cement Mixer Truck Die-cast Metal 1/64 scale (5-3/4 in long). Has rubber tires and Rotating drum. 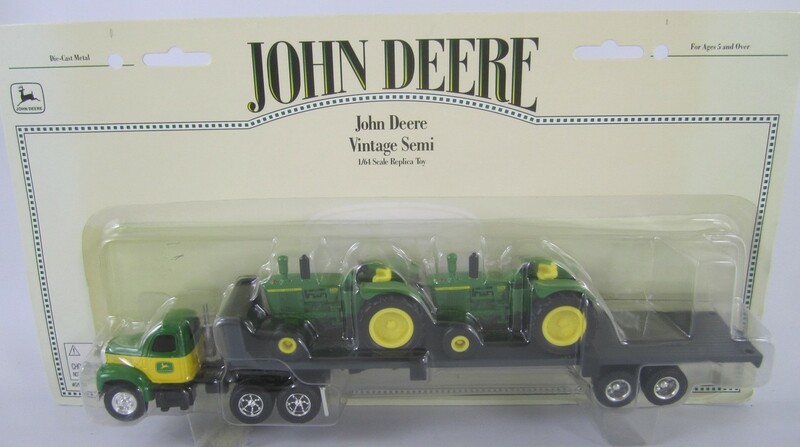 Ertl Stk # 5934 John Deere Tractor Set in 1/64 scale die-cast. This Set includes the following. 1960's B Model Mack Semi and two (2) JD 5020 tractors. 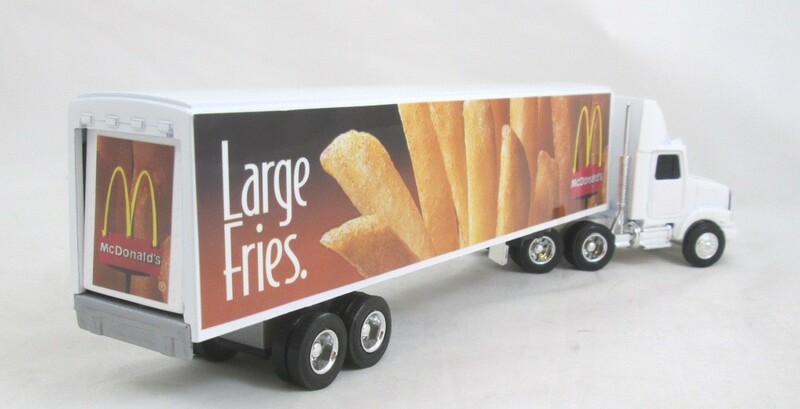 Ertl Stk# T620 McDonald's Lrage Fries White GMC Cab Semi Van Tractor Trailer. Die-cast Metal 1/64 scale (11 in long). 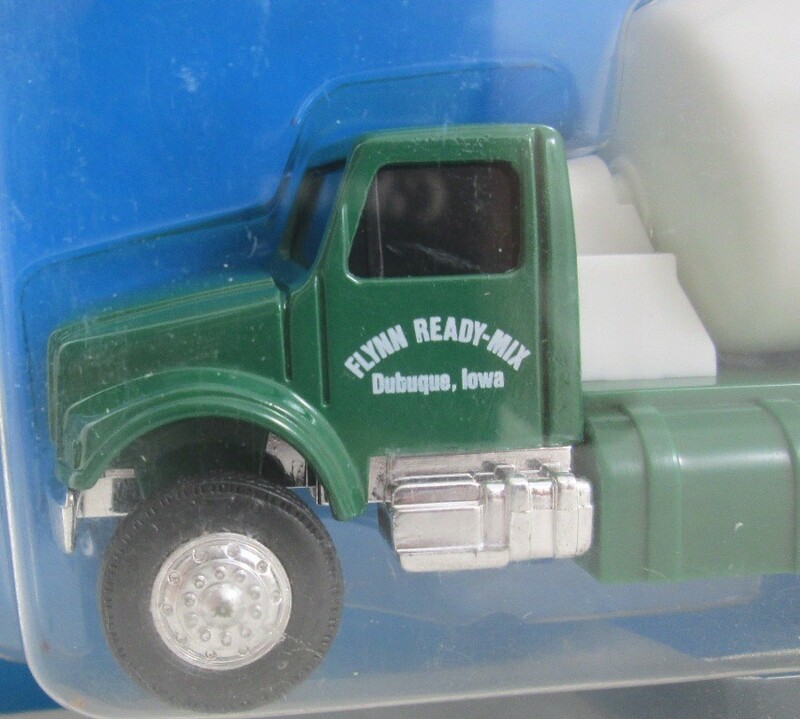 Die-cast Trailer has opening rear door. Real rubber tires. 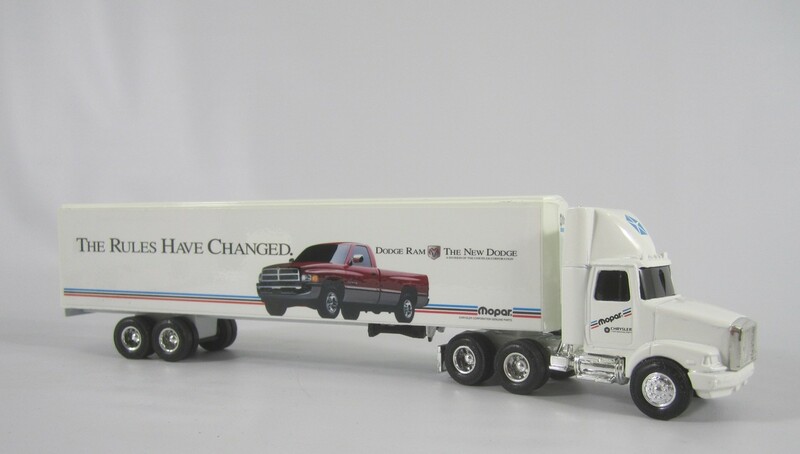 Ertl Stk# T149 Mopar Dodge Ram Truck, White GMC Semi Van Tractor Trailer. 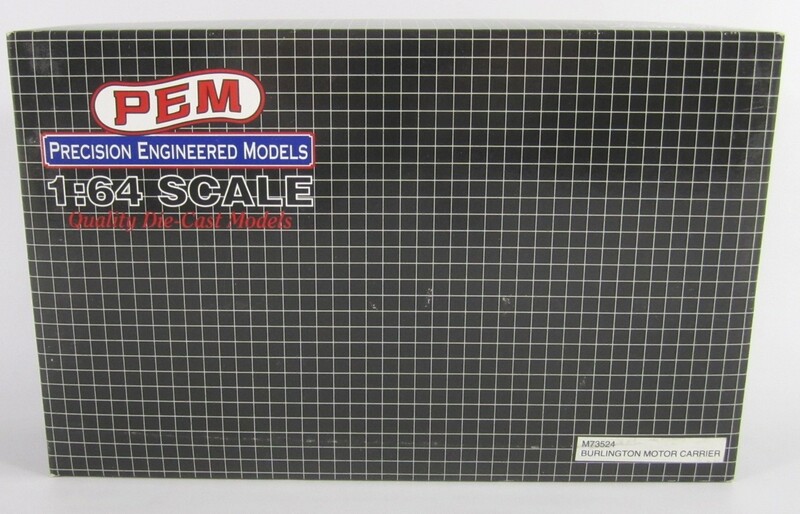 Die-cast Metal 1/64 scale (12 in long). Die-cast Trailer has opening rear door. Real rubeer tires. 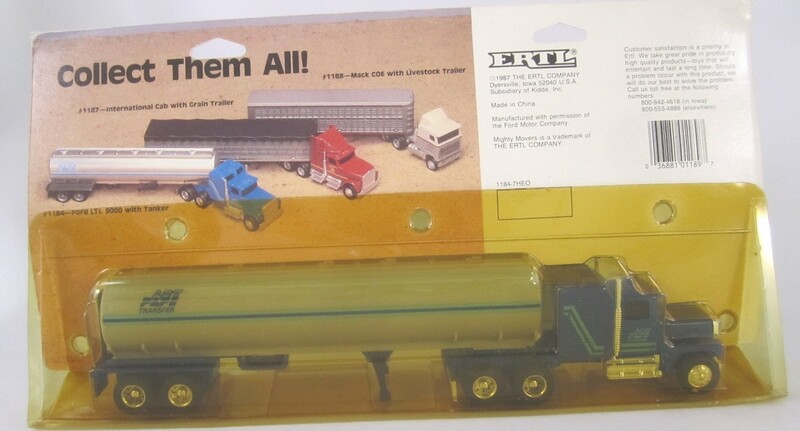 Assembled in U.S.A.
Ertl Stk# 9391 Mopar Chrysler Corporation Parts Cabover Semi Van Tractor Trailer. Dodge, Jeep, Chrysler and Plymouth. Die-cast Metal 1/64 scale (11 in long). 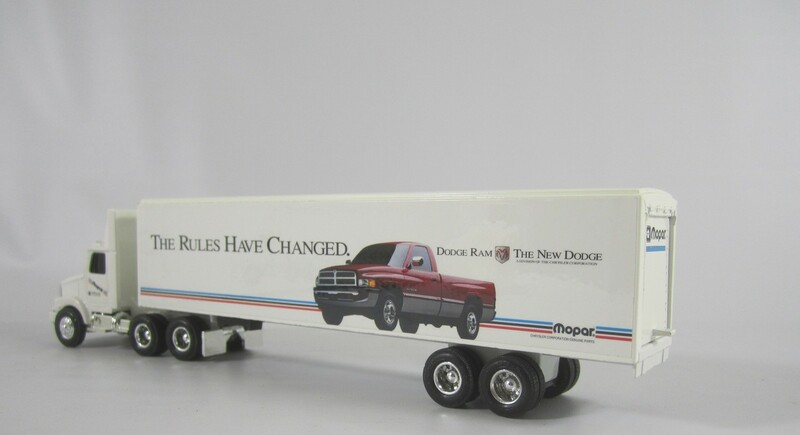 Die-cast Trailer has opening rear door. Real rubber tires. 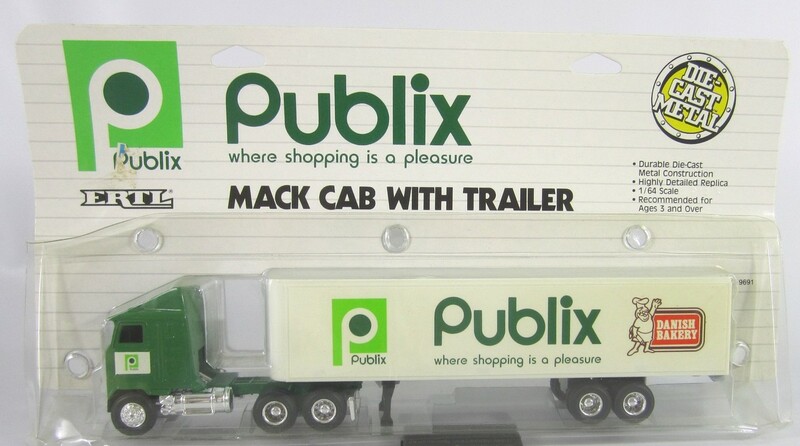 This the Ertl Mack cab but made after license ran out so the Mack name is not on the grill. 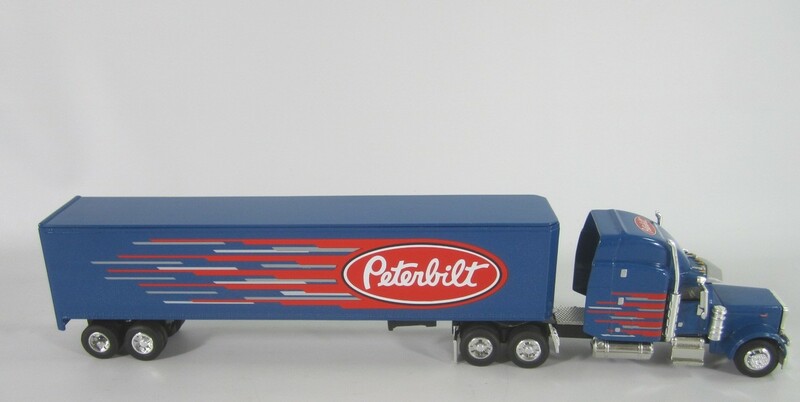 SpecCast Liberty Classics Stk# 32703 Peterbilt Semi Van Tractor Trailer. Diecast Metal 1/64 scale (11-1/2 in long). 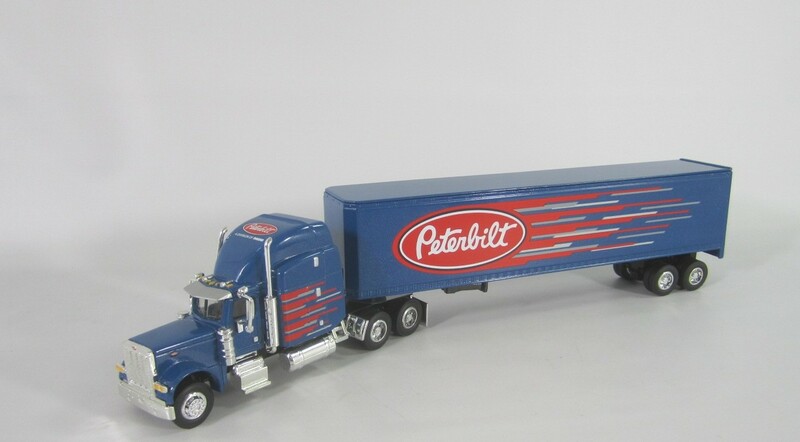 Diecast Peterbilt 379 Cab and Die-cast Trailer with opening rear door. 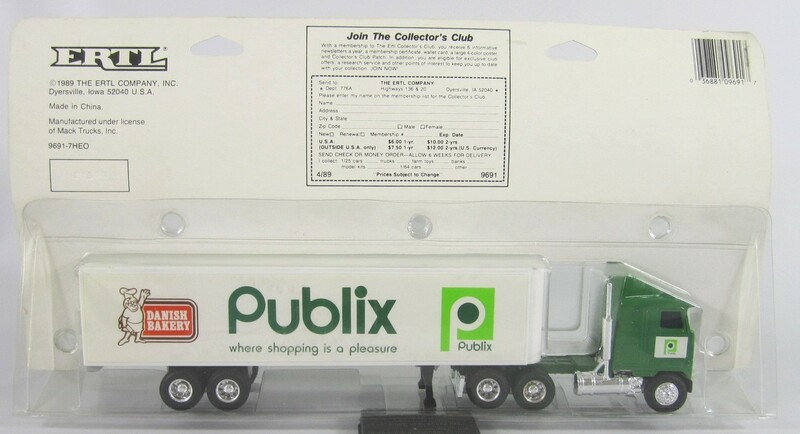 Ertl Stk# 9691 Publix Food Stores Tractor Trailer Semi. 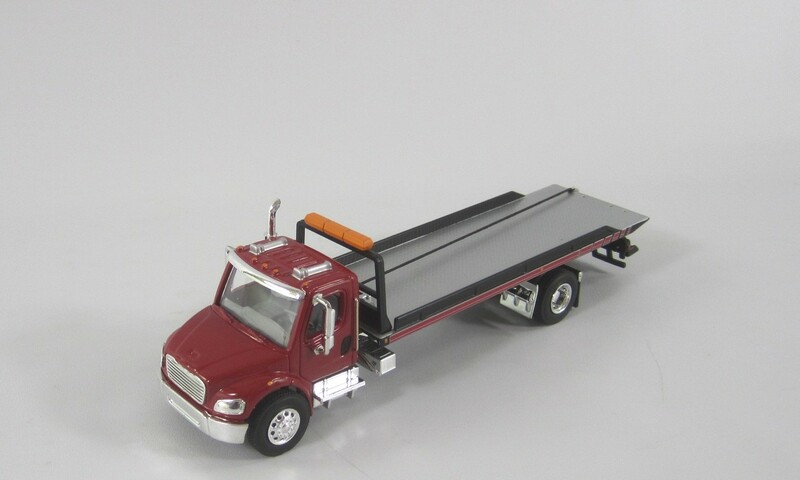 Diecast metal 1/64 scale (11 in long) Mack cab over and plastic trailer. PEM Stk# 70503 Rayovac Batteries and Lighting Products. 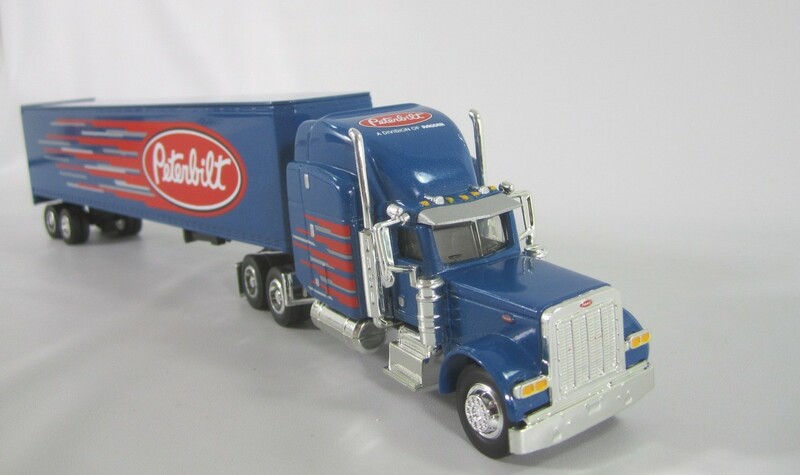 Diecast metal Kenworth T600A. Detailed model. New in Box, Opened Only for Photo. 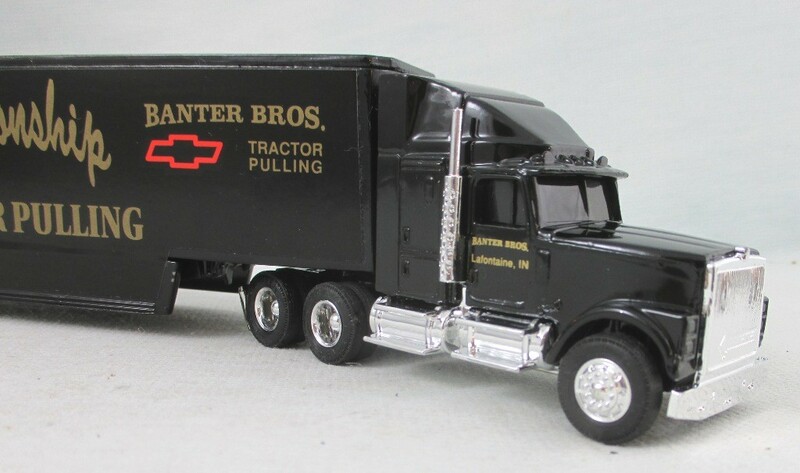 Ertl Stk# 9628 Ryder Trucking Tractor Trailer Semi. Diecast metal 1/64 scale (11 in long). 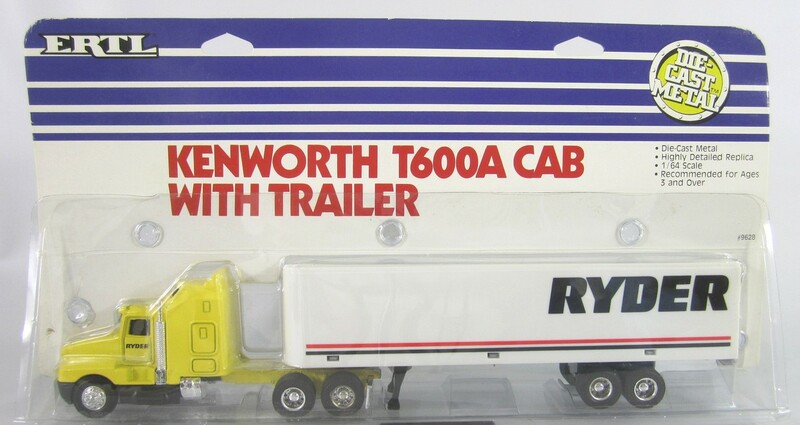 Kenworth T 600 A cab over and plastic trailer.